Posted October 31st, 2018 by UNT Special Collections & filed under 1980s. Happy Halloween! We hope you’re all having a spooky good time today. We dug up this charming feature from October 1988 on local puppeteer, John Hopkins who created amazingly lifelike monster costumes for Halloween. [News Clip: Monster Mash] on The Portal to Texas History. Posted June 14th, 2018 by UNT Special Collections & filed under 1970s. In honor of Pride Month, UNT Special Collections is sharing previously unseen footage of LGBT civil rights activist Harvey Milk during an appearance in Dallas. On June 10, 1978, 40 years ago this week, the Texas Gay Conference V was in full swing at the Royal Coach Inn near Dallas Love Field in Dallas, Texas. Under the theme of “Setting Sites on Human Rights,” the conference invited several gay civil rights activists. Among them was the newly elected member of San Francisco City Board of Supervisors, and first openly gay elected official in the entire state of California, Harvey Milk. UNT Special Collections recently sent 2,000 UMatic tapes from our NBC 5/KXAS Television News collection for digitization. As we sort through the 50,000+ digital news clips that will come back, we may not always immediately catch the gems we have preserved. Fortuitously, Morgan Gieringer, head of Special Collections, recognized Harvey’s familiar face even though he is not named on air. Even more incredibly, Morgan discovered the video exactly 40 years to the day it was recorded! What are the odds? The first clip is the packaged segment by reporter Noah Nelson, featuring an interview with Milk and Rev. Larry Hemp about LGBTQ+ youth, their future and hardships, and the second clip is the b-roll footage, or outtakes, from that segment. The b-roll footage has an extended portion of the Harvey Milk interview in which he says that he wants young gay people “to have hope, and know that they can become doctors and lawyers,” and with playful self-deprecation adds, “and politicians… God forbid.” Five months later, on November 27, 1978, Harvey Milk was assassinated by fellow city supervisor Dan White in San Francisco, California. The Texas Gay Conference V is further documented in UNT Special Collections’ LGBT Collection archives. The personal papers of Steve Wilkins, founding member of the Dallas Gay Political Caucus and co-chair of the Texas Gay Conference V, are housed within the Resource Center LGBT Collection. Posted June 11th, 2018 by UNT Special Collections & filed under 1990s. 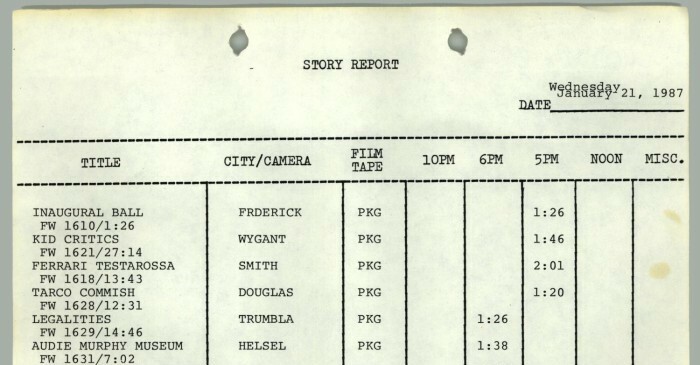 Archival footage from the NBC 5/KXAS Television News Archive was used extensively in the first episode of ABC’s true-crime miniseries “The Last Defense.” Archivists at UNT worked closely with producers at Lincoln Square Productions to conduct footage research, digitize original archive tapes, and identify relevant footage for Episode one, featuring Darlie Routier. In 1997, Darlie Routier was sentenced to death for the murder of her two sons. The murders, which occurred in Rowlett, Texas in 1996, captured the local public’s attention for many months. NBC 5/KXAS–TV captured extensive coverage of the case beginning with the discovery of the murder and continuing through an investigation and trial. Between the Jun 6, 1996 discovery of the murders, and the February 4, 1997 verdict in the Routier case, NBC 5/KXAS created over 160 news segments about the case. These have all been digitized and are available on the Portal to Texas History, and some will be featured in the ABC production. Darlie Routier will be featured in the first episode on “The Last Defense” a series which examines death row cases and the American justice system. Routier has maintained her innocence for 20 years on Death Row. [News Clip: Rowlett Stabbing pkg] on The Portal to Texas History. [News Clip: Routier (Death penalty) VOSOT] on The Portal to Texas History. Posted May 9th, 2018 by UNT Special Collections & filed under 1950s, 1960s, 1980s. Audie Murphy was born near Kingston, Texas in 1924 and enrolled in the military on his eighteenth birthday in 1942. During his lifetime he received every medal of valor which the United States can bestow, appeared in 45 motion pictures (acting in a starring role in 39 of them), and wrote a best-selling book which was later turned into a successful motion picture. It is not surprising that Murphy appeared frequently on in WBAP newscasts. Murphy made frequent appearances in Dallas and Fort Worth to promote his films and participate in Texas Amy National Guard events. Considering his dual status as war hero and movie star, he had many reasons to be recognized. 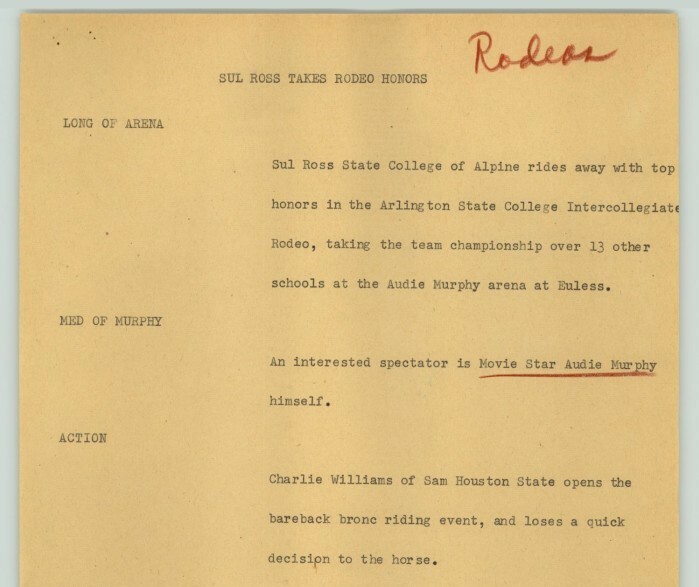 In honor of Audie Murphy Day (May 12, 2018) we are highlighting several of the broadcast news scripts from the WBAP archive which mention Murphy. Unfortunately, none of the film footage related to these scripts has been digitized and it remains in its original 16mm film format . Please contact UNT Special Collections if you would like to sponsor digitization of original news footage featuring Audie Murphy. The marriage of Audie Murphy to airline attendant Pamela Archer in Highland Park in 1951 is the first recorded instance of Murphy in the WBAP archive. In 1953, Murphey starred in two films distributed by Universal Pictures, Column South and Tumbleweed. He also found time to attend the Arlington State College Intercollegiate Rodeo which took place May 10, 1953 at Audie Murphey arena in Euless. Several weeks later, Murphey made another local appearance, this time with several other well-known Western movie stars include Gene Autry, Pat Butram and Dorothy Malone. The appearance, at the Palace Theatre in Dallas, was part of a benefit performance for victims of the Waco-San Angelo tornado. In 1950, Murphey joined the Texas Army National Guard as a captain of the 36th Infantry Division. He participated in Guard activities as a drill instructor during new recruit summer camps. He appeared on the news during the first week of camp on July 5, 1953 as Texas Governor Allen Shivers inspected the troops at Fort Hood. In 1955, Murphy made an appearance in Dallas to promote a new movie To Hell and Back, based on the best-selling autobiographical work written by Murphy about his wartime experiences. He played himself in the movie. The WBAP news crew caught Murphy again in 1962 as he was flying into Love Field for a short trip to Dallas. Murphy told the news that he would be “just loafing, playing golf, and visiting with friends,” during his trip. Murphy had just completed filming for a western called Six Black Horses. Murphy was also having his portrait painted by artist Dimetre Vail. Murphy was tragically killed on May 28, 1971, when a private plane on which he was a passenger crashed into a mountain in Virginia. Murphy was buried with full military honors at Arlington National Cemetery. The Audie Murphy American Cotton Museum in Greenville, Texas contains exhibitions of Murphy-related memorabilia, and is home to the Hunt County War Memorial featuring a 10-foot bronze statue of Murphy. KXAS News covered the opening of the Audie Murphy Museum in 1987. Posted May 4th, 2018 by UNT Special Collections & filed under 1980s, Uncategorised. 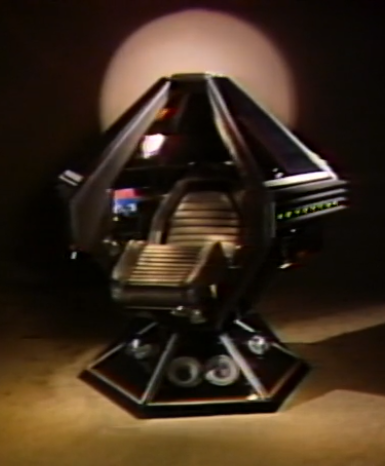 If only we could celebrate by taking a ride in the spaceship recliner featured in the 1982 Neiman Marcus Christmas Book, complete with a mini bar and wireless phone. Take a look at the chair in action in the following news story on the 1982 Christmas Book. Also featured in the video: dog sunglasses! [News Clip: Neimans] on The Portal to Texas History. Posted March 23rd, 2018 by UNT Special Collections & filed under 1980s. Today is #NationalPuppyDay so we’re bringing you a story about a puppy, only this Puppy is a bear! After “nipping” a man, Puppy the Sun Bear was charged with a potential death sentence. The judge did not sentence Puppy and he was allowed to live out his days scarfing down his favorite snacks of fruit and Dr. Pepper in a DFW backyard. All of our remaining undigitized UMatic tapes (1,924 total) are currently at an off-site vendor. We’re very excited to begin showing you more footage from the late 1970s and 1980s soon, including the first story that aired about Puppy in 1983. [News Clip: Bear trial] on The Portal to Texas History. Posted February 19th, 2018 by UNT Special Collections & filed under 1960s. On March 30, 1964, four months after the assassination of President John F. Kennedy, his Civil Rights Act finally entered into the Senate for debate only to be filibustered for over two months. In late May, just a few blocks from the Texas School Book Depository, Clarence Broadnax decided to grab a late lunch at the Piccadilly Cafeteria in downtown Dallas. Upon standing in line, he was quickly approached by employees and told that black people weren’t served at the Piccadilly, but Broadnax refused to leave and was taken to jail. Released immediately, he returned to the Piccadilly and was arrested a second time. This time, they held him until the restaurant closed. Upon returning to the closed Piccadilly, he was met with local reporters and interviewed about the incident. Dallas NAACP leader, Juanita Craft, saw the interview and contacted Clarence that night to organize an estimated 350 protesters to meet him at the Piccadilly the following day, May 30th. [News Clip: Demonstrators] on The Portal to Texas History. Protesters gathered at the Piccadilly Cafeteria for 28 straight days. Led by Broadnax, along with the Reverend Earl Allen and Bishop College student Ted Armstrong, they endured several injunctions to leave, along with hundreds of counter-protestors, including the Jaycees of Dallas and Mississippi who marched a street-wide Confederate flag down Commerce Street. [News Clip: Hearing] on The Portal to Texas History. During the protests, on June 19, the Civil Rights Act of 1964 passed both houses of Congress. Following an agreement made by the manager of the Piccadilly Cafeteria and Rev. Allen, the demonstrations ceased on June 27. On July 2, President Johnson signed the act into law. We were excited to re-discover this footage and we hope that it will shed new light on an often forgotten portion of the Civil Rights Movement in North Texas. We are happy to report that footage of the Piccadilly Cafeteria protests will eventually be included in the Dallas Holocaust Museum’s new “Upstanders” exhibit upon the opening of their new permanent location. View additional footage of the Piccadilly protests and their corresponding news scripts in the NBC 5/KXAS (WBAP) News Collection. Posted February 14th, 2018 by UNT Special Collections & filed under 1980s. Would you buy remaindered candy for your sweetheart on Valentine’s Day? In 1982, people “poured” through the doors of the Candy Outlet seeking discount goodies for themselves and their loved ones. [News Clip: Valentine cost] on The Portal to Texas History. Posted January 19th, 2018 by UNT Special Collections & filed under Uncategorised. Today we celebrate National Popcorn Day with NBC 5/KXAS footage celebrating a beloved Dallas popcorn seller. Marvin (Pete) Colgrove volunteered selling popcorn at Texas Scottish Rite Hospital for Children in Dallas, from 1984 through his last year of life in 1994. The money earned from the sales went to the Volunteer’s Auxiliary which purchased equipment for the hospital and provided activities for the children. [News Clip: Pete Colgrove] on The Portal to Texas History.